A recent market study published by PMR– “Global Industry Analysis 2013 – 2017 and Forecast 2018 – 2026: Global Industry Analysis 2013 – 2017 and Forecast 2018 – 2026” consists a comprehensive assessment of the most important market dynamics. On conducting a thorough research on the historic as well as current growth parameters of the aesthetic lasers and energy devices market, growth prospects of the market are obtained with maximum precision. The report features unique and salient factors that may make a huge impact on the development of the aesthetic lasers and energy devices market during the forecast period. It can help market players to modify their manufacturing and marketing strategies to envisage maximum growth in the aesthetic lasers and energy devices market in the upcoming years. The report provides detailed information about the current and future growth prospects of the aesthetic lasers and energy devices market in the most comprehensive way for the better understanding of readers. 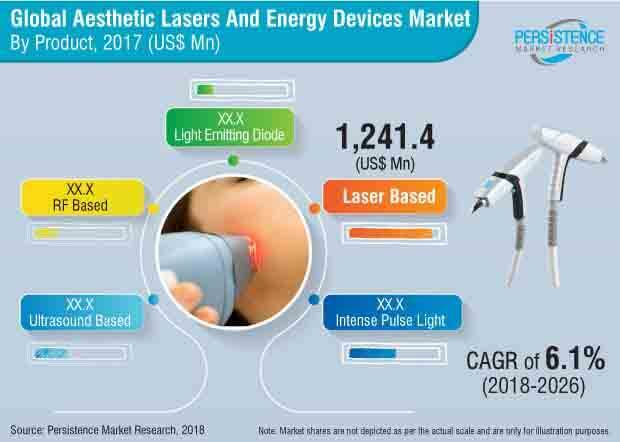 The report commences with the executive summary of the aesthetic lasers and energy devices market report, which includes the summary of key findings and key statistics of the market. It also includes the market value (US$ million) estimates of the leading segments of the aesthetic lasers and energy devices market. Readers can find detailed taxonomy and the definition of the aesthetic lasers and energy devices market in this chapter, which helps readers to understand the basic information about the aesthetic lasers and energy devices market dynamics, supply chain, cost structure, pricing analysis, list of key distributor and suppliers, list of key market participants included in the report. This section helps the readers to track the market scenario, with key inferences drawn from historical data, current trends, and future prospects. It also highlights the key market opportunities, macroeconomic factors and background to market development. In this chapter, readers can find detailed information on the drivers, restraints, trends that govern the market growth. Additionally, impact analysis of drivers and restraints that influence the market dynamics are also included in the report. Some of the key parameters are provided in this section, helping readers with more information to deep drive into the market scenario. This chapter includes detailed analysis of the growth of the North America Aesthetic lasers and energy devices market along with the country-wise assessment including the U.S. and Canada. Readers can also find regional trends, regulations, and market growth based on product type, end user, application and country of aesthetic lasers and energy devices in the North American region. Readers can find detailed information about factors such as, incremental opportunity, Y-O-Y growth and regional trends that are impacting the growth of the Latin America Aesthetic lasers and energy devices market. This chapter also includes the growth prospects of the aesthetic lasers and energy devices market in leading LATAM countries such as Brazil, Mexico and rest of the Latin America region. Important growth prospects of the aesthetic lasers and energy devices market based on its product types, end user, and applications in several West European countries, such as EU4, Russia and Rest of Western Europe is included in this chapter. India, Australia and New Zealand are the leading countries in the APECJ region that are the prime subject of assessment to obtain growth prospects of the APECJ Aesthetic lasers and energy devices market in this chapter. Readers can find thorough information about the growth parameters of the APECJ aesthetic lasers and energy devices market during the period 2018-2026. Readers can find important factors that can make a huge impact on the growth of the aesthetic lasers and energy devices market in Japan based on the market segmentation, during the forecast period. This chapter provides the overview of regulations, drivers, restraints, and trends in the Japan aesthetic lasers and energy devices market. Important growth prospects of the aesthetic lasers and energy devices market based on its product types, end user, and applications in several West European countries, such as GCC Countries, South Africa and Rest of MEA is included in this chapter. This section provides the relevant factors and their impact on the market, which were taken into consideration to build the market for the current year 2017 and make the market forecast (2018-2026). It will help the readers to be more informative and know which factors play key role in shaping the present and future of the market. In this chapter, readers can find a comprehensive list of all the leading stakeholders in the aesthetic lasers and energy devices market along with detailed information about each company, including company overview, revenue shares, strategic overview, and recent company developments. Market players featured in the report include as Hologic Inc. (Cynosure, Inc.), Lumenis, Syneron Medical Ltd., Lynton Lasers Ltd, EL.EN. S.p.A. (Deka Mela S.r.l. ), Fotona, Cutera, Inc., Lutronic Corporation, Beijing Nubway S & T Co., Ltd,. This chapter explains how the aesthetic lasers and energy devices market will grow across various geographic regions, such as North America, Latin America, Europe, Asia-Pacific Excluding Japan (APEJ), Japan and the Middle East & Africa (MEA). Based on the product type, the aesthetic lasers and energy devices market is segmented into reusable and disposable. In this chapter, readers can find information about key trends and developments in the aesthetic lasers and energy devices market and market attractive analysis based on the product type. In this chapter, readers can find information about key trends and developments in the aesthetic lasers and energy devices market and market attractive analysis based on the product type for each region. Based on the End User, the aesthetic lasers and energy devices market is segmented into hospitals, clinics and ambulatory surgical centers. In this chapter, readers can find information about key trends and developments in the aesthetic lasers and energy devices market and market attractive analysis based on End User. In this chapter, readers can find information about key trends and developments in the aesthetic lasers and energy devices market and market attractive analysis based on the End User for each region. Based on the Application Type, the aesthetic lasers and energy devices market is segmented into minimally invasive surgeries, open surgeries and other allergens. In this chapter, readers can find information about key trends and developments in the aesthetic lasers and energy devices market and market attractive analysis based on application type. In this chapter, readers can find information about key trends and developments in the aesthetic lasers and energy devices market and market attractive analysis based on the application type for each region. This chapter helps readers to understand the research methodology followed to obtain various conclusions, important qualitative information, and quantitative information about the aesthetic lasers and energy devices market. Aesthetic Lasers and Energy Devices is largely dominated by small and Israel based manufactures who are competing on the basis of pricing in the market. The fragmented nature of the market mainly in devices, decreases the profitability of the business. However, growing awareness about aesthetic based skin and body rejuvenation Lasers and Energy Devices have increased the revenue opportunities for leading manufacturers to invest in Aesthetic Lasers and Energy Devices market. Companies, Hologic Inc. (Cynosure, Inc.), Lumenis, Syneron Medical Ltd., Lynton Lasers Ltd, EL.EN. S.p.A. (Deka Mela S.r.l. ), Fotona, Cutera, Inc., Lutronic Corporation, Beijing Nubway S & T Co., Ltd, are the leaders in the global Aesthetic Lasers and Energy Devices market. These companies are also investing lucratively for lunching new and advanced Aesthetic Lasers and Energy Devices. Furthermore, companies operating in Aesthetic Lasers and Energy Devices market are collaborating with wholesalers & retailers around the world to increase the penetration of their Aesthetic Lasers and Energy Devices offerings in market. For instance, On April 4, 2017, Deka Technologie Laser (DEKA’s French subsidiary) announced that the company has entered into a distribution agreement with Quanta System SpA to distribute and marketing El.En. Group laser systems in France. Nowadays, two or more laser based Aesthetic Lasers and Energy Devices are found to be widely used in various skin rejuvenation procedures. For example, in tattoo removal aesthetic procedures, use of single laser based devices can be challenging. Inks used in the lasers based Aesthetic Lasers and Energy Devices gets retained inside when performing multiple sessions for tattoo removal. At times tattoo clearance becomes incomplete and takes subsequent sessions in certain cases. Adverse reactions such as blistering and dyschromia may happen during the treatment tenure. These obstacles can be overcome by using combined mode of tattoo removal treatment, which increases the demand Aesthetic Lasers and Energy Devices. For instance, combining fractional lasers with Q-switched laser has proven to minimize the post treatment side effects such as blistering. In addition, it has also lessened the number of treatment visits along with faster clearance of tissue. Over the years, increased awareness amongst people about non-invasive surgeries with lesser side effects has increased the adoption of non-invasive Aesthetic Lasers and Energy Devices. Furthermore, Non-invasive skin rejuvenation and wellness treatment with lasers based, Intense Pulsed Light based and LED equipment has reduced hospital stay as they are designed to provide quick and faster recovery. These are also some other factors that contribute to the demand for non-invasive surgeries with Aesthetic Lasers and Energy Devices. For instance, In 2015, Lumenis announced the launch of the new ResurFX laser system for fractional non-ablative skin resurfacing treatments. It is also well known that Aesthetic Lasers and Energy Devices are associated with a number of side effects, as these medications work differently on different skin types and texture. For instance, absorption of excess laser light can result in skin discoloration and blistering for a darker skin tone than lighter ones. Such post treatment side effects can dissuade people from opting for these treatments, and can also negatively impact the overall Aesthetic Lasers and Energy Devices equipment market growth. Competition section of the histopathology testing equipment market features profiles of key players operating in the industry based on their market shares, differential strategies, histopathology testing equipment product offerings, marketing approach and company dashboard. Some of the key players featured in this report include as Hoffmann-La Roche A, Thermo Fisher Scientific, Inc., Danaher Corporation, Agilent Technologies, Inc., Merck KGaA. Key manufacturers of histopathology testing equipment are focusing on innovative marketing strategies to increase both their product portfolio as well as geographical presence. The companies manufacturing histopathology testing equipment are strategically focused pricing strategies in order to lead the market of histopathology testing equipment. Some other key market strategies followed by histopathology testing equipment manufacturers include lucrative discounts, strong distribution network for consumables and equipment, partnering with local as well as global retailers, and long term partnership pathology laboratories, hospitals and contract research organizations. Histopathology Testing Equipment are composed of instruments and consumable products, which are used to facilitate the histopathology study for diagnosis and diseased tissues. In broad sense, the study involves processing the tissue using histopathology testing equipment and finally examining these tissues and/or cells under a microscope for examining morphological changes. PMR conducted a research study on histopathology testing equipment market for the forecast period 2018 to 2028. The histopathology testing equipment market report offers a comprehensive evaluation of the business opportunities prevailing in the histopathology testing equipment market along with insights on the histopathology testing equipment, trend, device prices and awareness level for histopathology testing equipment market competition. The report elaborates on the macroeconomic factors influencing the dynamics of histopathology testing equipment market and its futuristic potential. The report offers a comprehensive taxonomy of histopathology testing equipment market based on product type, end user, application type and region. Based on product type, the histopathology testing equipment are segmented as instruments and consumables. The histopathology testing equipment find application in various chronic, cancers, tumors diseases and also in drug discovery. These histopathology testing equipment devices are used by hospital based labs, diagnostic centers and research organizations for various type of histopathological study. The histopathology testing equipment market has been analyzed across regions of North America, Latin America, Western Europe, Eastern Europe, Asia Pacific Excluding China & Japan, China, Japan and MEA. What the revenue potential is of histopathology testing equipment across regions of North America and Western Europe? Who are the key competitors and what are their portfolios in histopathology testing equipment market? What are major challenges influencing the growth of histopathology testing equipment market? How intervention from regulatory authority is shaping the histopathology testing equipment market growth? The histopathology testing equipment market has been estimated based on supply-demand approach. The market was first calculated based on histopathology testing equipment volume conducted in different region/countries. The test volume was estimated based on instrument installation in top 20 countries globally. Other qualitative factors analyzed during test volume estimation include awareness level for histopathological and other anatomic pathological diagnostic tests. This information is further validated with rigorous primary research (including interviews, surveys, in-person interactions, and viewpoints of seasoned analysts) and secondary research (including verified paid sources, authentic trade journals, and resourceful databases). The research study on histopathology testing equipment market also includes top trends and macro as well as micro economic factors shaping the histopathology testing equipment market. With this approach, the report on histopathology testing equipment market anticipates the industry attractiveness of every major segment in histopathology testing equipment devices market over the forecast period.